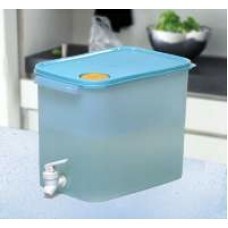 8.7 litre capacity is ideal for a family’s consumption or for outdoor activities. Air and liquid-tight seal keeps water clean, safe and free from contamination. Back grip provides a steady hold when pouring. Side grips allow for easy handling, especially when container is full and needs to be lifted. Vent cap prevents “vacuum effect” when dispensing water, allowing air to enter for a steady flow of liquid. Leak-proof translucent window allows you to see when contents is low. Comes with a tap for easy opening and closing. It can be detached for easy cleaning. Actual color of products may vary slightly than what shown.